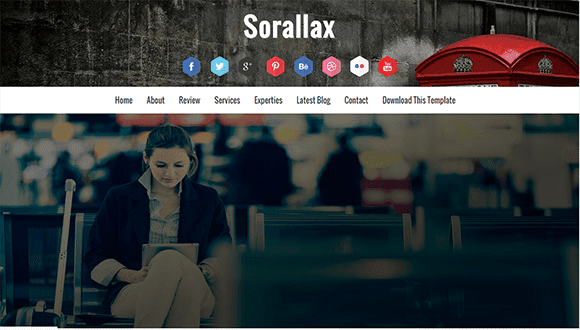 Sorallax Blogger Template is a most advanced landing page template for blogger which provides lots of incredible features. Sorallax is a responsive blogger template so you don't have to worry about its style on different devices. Sorallax is equipped with various of widgets which will help you to publish your blog more professionally. To make it easy for you we have published this detailed documentation, so that you can setup your blog correctly. You have made a good decision by choosing our template. You can check the live demo or download the template through the button below and also Please Read this documentation carefully in order to set up your blog and please note that there’s no support for free users. Change the links with your own social links. Note:- Don't change anything else, otherwise the widget will not work properly. Change the details with your own. Note:- Don't change the href=' ' Values Otherwise the menu will not work. This is the title for recent posts you will publish. Change the details with your desired one. Change the highlighted text with your own. Change the value of perPage: 7 from 7 to any number you want (Archive). Team, all I wanted is to change the FLASK, ENVELOPE, ROCKET, COFFEE icons to something else that match the beach resort site I am launching soon. My question is: what other items I could REPLACE that icon? All these icons are supported. Hi, I already bought this template. How can I have some support? You are already getting it through this reply.